2. frame construction: sturdy, strong,resistant and light weight with good powder coating aluminum frame, Rustproof welded aluminum frame ,not recycled, the surface is treated with powder coated and oxidation and sensational fastness. a. easily removable cushion and cover with high desity foam. d. waterproof fabric and with zipper. 4. Powder Coating: Powder coating spraying are all hand sprayed,achive high quality powder coating on the furniture frames,frames will be coated with the proper choice of colors according to the choice of the wicker color selected. This suit is manufactured using our all weather rattan materials which makes it ideally suited to outdoor use. 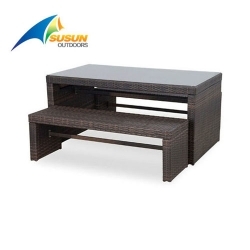 It is UV light resistant to ensure that the coloured rattan does not fade. It is light, durable and low maintenance, any dust or dirt can easily be washed off with water. The synthetic rattan is hand woven over a rust resistant frame and is designed to live outdoors all year round. The Classical styling also means that it would not look out of place in a conservatory. 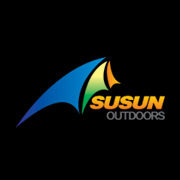 SUSUN OUTDOORS CO.,LTD is a professional manufacturer of Camping Tent , Pop Up Tent , Dome Tent , Beach Tent , Family Tent ,children tent, Hunting Tent , Pet Tent ,swag,roof top tent,Mummy Sleeping Bag,Envelope Sleeping Bag,down Sleeping Bag ,Kids Sleeping Bag,Camping Chair, Beach Chair , Fishing Stool ,folding chair, Sun Chair , Moon Chair ,Director Chair,recliner chair,kids chair and Camping Bed and Outdoor Furniture,rattan furniture,Metal Furniture etc. in China with over 20`s years experience. Looking for ideal Rattan Barstool Manufacturer & supplier ? We have a wide selection at great prices to help you get creative. All the Outdoor Rattan Barstool are quality guaranteed. We are China Origin Factory of Moderm Rattan Barstool. If you have any question, please feel free to contact us.